LA Unified is preparing its first-ever unified enrollment system, but signs that it’s already running off the tracks have spurred an influential group of advocates to band together to make sure the final product is equitable and accessible to all. The biggest obstacle to success they cite is leaving out charter schools, which already educate more than 107,000 of the district’s 660,000 students and continue to grow. And while district officials say they might eventually include charters, the system now taking shape isn’t showing that’s likely. And even charter school operators are hesitant to join an enrollment system controlled solely by LA Unified. “As of now there does not seem to be a strong desire from either LAUSD or the charter sector to move toward true unified enrollment, so we don’t think the district’s current plans include the building of a system that can later include charters,” said Seth Litt, executive director of Parent Revolution, one of seven advocacy groups in the new coalition. 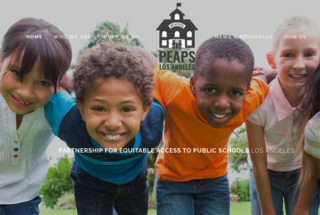 The group is called Partnership for Equitable Access to Public Schools Los Angeles, whose acronym will be PEAPS-LA. It includes Alliance for a Better Community, Families in Schools, Los Angeles Urban League, Learning Rights Law Center, Partnership for Los Angeles Schools, and Parents for Quality Education. The goals of the new coalition are easy access to information (online and offline), a single application process for all public schools including charters, enrollment processes so schools can accurately budget and hire staff, and a way to ensure quality public schools are accessible to all families. And to do that, charters need to be included — a refrain that has been sounded even by the teachers union. At a recent school board committee meeting where the unified enrollment system was being discussed, a committee member representing UTLA pushed for the inclusion of charter schools. And Partnership for Los Angeles Schools, which operates 19 district schools, released a policy paper earlier this month that called for creating a system that includes all publicly funded schools, including charters, even if it is not feasible to include them in the short-term. No one disagrees that the current way of finding and enrolling in a school needs fixing. Many low-income families and new immigrants to the city are disadvantaged by the complexity of the current system. There are about 10 kinds of public school options, including magnet schools, open enrollment, zones of choice, affiliated charters and independent charter schools. Each type of school has a different application process — some are only paper applications directly to the school — with unique deadlines that range from October through May and different timeframes for finding out if the student has been accepted. Even some of the systems within LA Unified don’t talk to each other and applications are managed by different departments. Independent charter schools, which enroll about 16 percent of LA schoolchildren, each have different application processes and deadlines. Litt said the coalition will also be advocating for charter schools to move to a single application system. “In all that complexity a lot of the highest needs families can’t use the system to optimize their chance of getting into a quality school,” Litt said. The coalition wants to ensure that LA Unified uses the examples set in other cities that have created a unified enrollment system like New Orleans, Denver, and Washington, D.C., that include traditional and charter schools. Litt’s Parent Revolution is fresh off an unsuccessful battle advocating for the State Board of Education to adopt a single rating as part of California’s new school accountability dashboard, which they argued would help parents more easily compare schools. Parent Revolution also published a report in January that found that half of all Los Angeles public school students are part of school choice programs, but that finding a quality school can be a full-time job, which is a barrier for many low-income families. George Bartleson, LA Unified’s chief of school choice, said the district has been working with some of the organizations that are part of the coalition since it began developing the system. “We plan to be very collaborative, not only with PEAPS, but with other organizations that would also like to have input regarding unified enrollment,” he said. The system that will launch in the fall will include a way for parents to search for schools by different programming options they are looking for like after-school programs or Mandarin language classes, said Ani Bagdasarian Packard, a program policy development adviser working on the project, something that isn’t available right now. In the fall launch, the system will allow parents to apply to magnet schools, permits with transportation and dual language and immersion programs at the kindergarten and first-grade levels. These programs will have a common application and timeline. Affiliated charter schools will be part of the next phase, Bartleson said. He said the district is still discussing with independent charter schools whether and how they might be involved. Schools’ equity reports as part of the California School Dashboard will be linked from the school search tool when they become available. One reason charter operators are hesitant to change their application processes is because LA Unified considers that change a material revision to its charter, which must be approved by the school board, Litt said. “From what we understand charter schools are wary of entering in a system that is totally controlled by LAUSD,” he said. Chase Stafford, PLAS’ senior manager of policy and planning, who wrote the policy paper, said for school principals, it is difficult to budget and staff for the upcoming school year because the enrollment systems and timelines aren’t in sync. “They don’t really know what students are coming to the school until the first day of school,” Stafford said.